On 31 August 1944, the SS-Panzer Abteilung 102, Waffen SS’s heavy tank division retreated towards Germany after a 20 day stand at Hill 112 near Caen (see Operation Jupiter). In the map above the left most marker is Utah, second one from the left is Omaha, Hill 112 is the 2nd from the left and Rouen is the one to the left. The division was almost destroyed by the heavy fighting and had to abandon their tanks at Rouen by the shore of the Seine. On the night of August 31, a team of soldiers, mechanics and tankers crossed back to the western shore of the Seine to destroy the abandoned tanks. Amongst the wrecks they found two abandon Panthers sitting immobile, with local partisans trying to figure out the mechanical beasts. The German’s mission was to destroy the two Panther’s and the partisans, the BCRA Maquis de Rouen, were to protect their prizes at all costs. Witchbottles played the Germans and I the partisans. We got German conscripts and self rallying crew pitted against partisans who couldn’t form fire groups, has low ammo and tend to break toys easily. This is the initial setup, and the north is on the right. 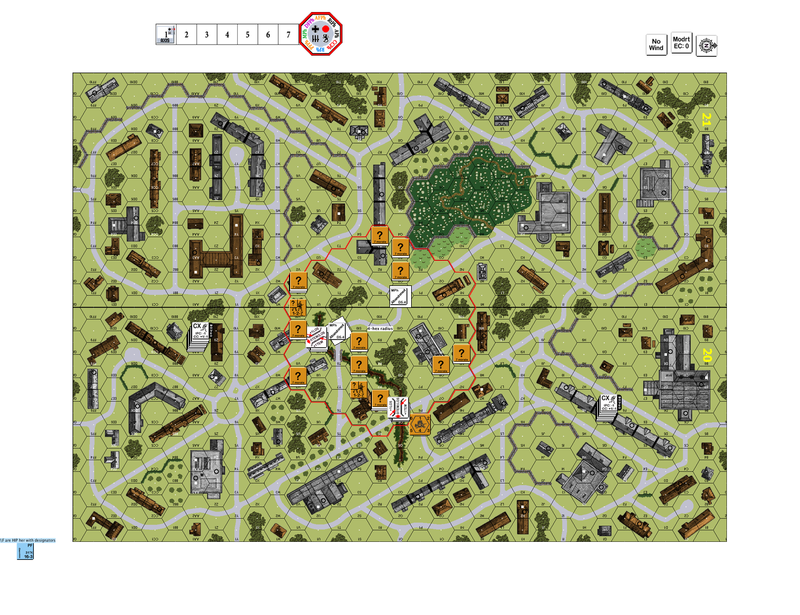 The partisans couldn’t stack and couldn’t be more than four hexes away from a specified hex. I looked to use the gully as a protected passage between the forces to the east (bottom of the map) and their comrades on the south side (left of the map). The Germans enter from the left and the bottom of our screen. As it turns out, the Germans from the left took the direct route but the Germans from the bottom took a long detour around the partisans to the north. As the turns progress, this flanking move would take the northern defenders off their prepared positions. Over to the south (left), an all out street fight ensured. The partisans tried to stay concealed for protection but took every opportunity to snapshot the Germans between the one hex buildings. To the north (right) the Germans outflanked the partisans and started to make their way to the Panthers, darting between the tombstones. After the game, Witchbottles observed that he would have rushed forward to occupy the large stone structure to the upper right of the northern partisan forces, to the right of the graveyard (dark green). That would have secured the partisan’s northern flank, no doubts. The German unit I marked off with a yellow circle and an arrow was the unit who managed to put a panzerfaust into the side of the Panther. The partisans I marked off with rough dotted lines in the middle was the partisan squad that killed a German half squad with gunfire but attracted a sniper shot to the Panther on the top right (to the lower left of the dark green graveyard). The shot that killed the partisan commander stunned the crew and they promptly abandoned their big toy. One Panther burning, one Panther abandoned. A partisan squad managed to run to the graveyard walls and took a couple of shots at the approaching tank crew and promptly ran out of ammo. The mechanics and crew realized they couldn’t get a good shot at the Panther from the graveyard and so they came over the walls. 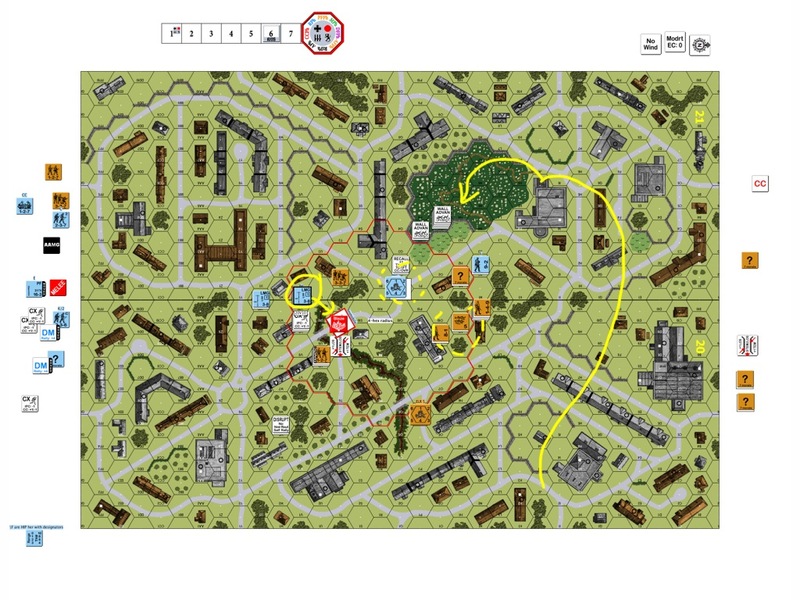 In the German Turn 6 the game ended at the Advanced Fire Phase when the Germans nailed the second Panther. In retrospect aside from moving to occupy the big stone building to the north and thus securing my northern flanks like Witchbottles advised, I should make better use of fire lanes and residual fire. Next time! You live and learn. A big THANKYOU to Witchbottles for a very interesting game! 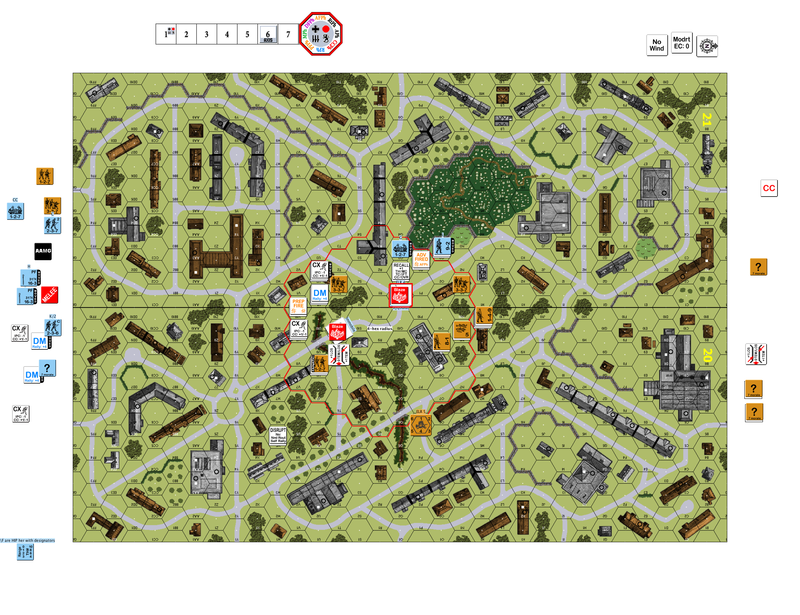 This entry was posted in Game Play and tagged AAR, Advanced Squad Leader, ASL, Board Game, board wargame, partisan, PBEM, VASL, wargame, World War II. Bookmark the permalink. I played this scenario earlier this year. Interesting for sure. Keep in mind that MGs with ammo shortage cannot lay fire lanes… Although captured SW don’t suffer from ammo shortages.